Northern Ireland-based Mark David Allen clinched the title of World Snooker Haikou Open, beating English Stephen Lee 10-1 in the finals on Sunday. Allen also put the prize of 75,000 pounds (about 118,746 U.S. dollars) into his pocket with the integration of 7,000 points. 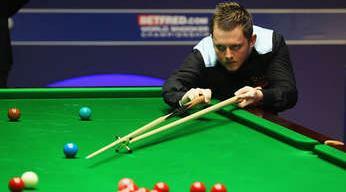 What is more, this is also his first ranking champion since he became a professional snooker in 2005. Allen found his best form at the beginning and obtained easy wins for the first five frames in taking a 5-0 lead. However, Lee fought back to win the sixth frame with a break of 67 points. During the next two frames, which featured quite a lot of defenses from both sides, Allen seized the chance to win and make a 7-1 lead. And Allen continued his good form to have a run of 123 points in the ninth frame and lead 8-1 to the mid-session interval. Allen still kept a good form after the interval and controlled the rhythm in the long-time defense for both sides, leaving Lee not to get the ball many times and lose points in the 10th frame and finally won it to have a 9-1 lead. During the 11th frame, Allen made a break of 104 points when Lee made mistakes in giving defense, and claimed the victory. "I played very well in the first five frames though it is hard to keep concentration, still I can keep it to the end, no chance for Lee to reverse," Allen said. "I did not have a good sleep last night, making a bad play today. Also Allen played well," Lee said. World Snooker Haikou Open, held from Feb. 27 to March 4 in China’s Hainan Province, attracted many top snookers in the world and eight Chinese snookers including Ding Junhui. The tournament will be held in Haikou, South China’s Hainan Province for five years.